If you fancy an experiment? Thread: If you fancy an experiment? The bucket had 2x 50% water changes per day using pond water and I specifically tried to collect water containing fines/debris so as not to starve the bacteria whilst I was at work and the pure ammonia had been fully consumed. Therefore these fines would have been sucked through the Eheim filter and collected by the static K1. However the brown colour of the K1 from the Eheim doesn't look like it could be wiped off like dirt, it appears to be "stained". Hmm, in that case, I can't think of any reason why the bugs in the bucket shouldn't be the same colour as those in your pond biofilter when they've obviously reached such an advanced state of maturity that they can process 30 ml of household ammonia (and the resulting nitrite) per day and they have access to the same fines. Incidentally, I may not have made myself clear about what bugs do to hide. 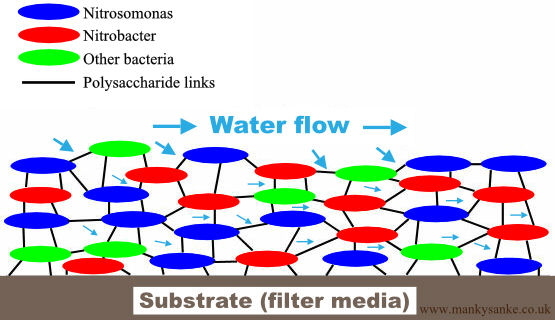 Nitrifying bugs form biofilms, as in the picture below, and the debris that they use to hide behind is incorporated into the biofilm. I didn't include this in the diagram so as to keep the basic structure as uncomplicated as possible but these biofilms are very tough so you couldn't wipe them away or the brown discolouration in them. Sadly, 36 hours after adding this well matured media to the Nexus there are no improvements in pond parameters. strange that the nitritite is converting the bucket and not in the pond. I have a number of conclusions which I believe contributed to solving the problem (time obviously being one of them), but if I was to guess where the breakthrough came it would be the K1 that had matured inside a static filter. This K1 still stands out in the Nexus as being much darker than the rest and is filled with furry brown type growth inside the protected areas, whereas other K1 still looks relatively white in comparison. Just to muddy the water a bit, so to speak, I found the opposite - I have a large multibay with K1 in three bays. It had been there a couple of years static in bags. I decided to get one bay moving. After a few months I noticed the moving K1 was darker in colour than the static, which finally decided me on getting it all moving. None of it has any fury brown growth though - mind it is sitting after a drum which might have something to do with it perhaps?? That might not be the opposite to my situation as you suspect. My K1 that was matured in a static environment continued to get darker than the K1 that has always been in a moving environment AFTER it was transferred to the moving environment. i.e It built up colonies of bacteria whilst static, and (assumption based on colour alone) continued to mature at a rapid rate after being transferred to the moving bed. Whereas K1 that has been moving since day 1 still looks significantly whiter. But ... I don’t think there is really any evidence out there that the colour of your media is related to the thickness of the bacterial colony. My media a quite a pale creamy beige colour. Ive noticed that all the mature media in Mark’s bio chambers at Cuttlebrook is also that colour. Yes, I go around checking out otter peoples media If your media is darker brown in the middle then I would think it is just dirty TBH. I think there is some evidence - it clearly isnt just dirt. There is a definitely a link to the bacterial colony maturity. New media takes quite a while to merge in with existing even if you pp it thoroughly. My moving K1 bay was after two static bays of K1 that were lighter in colour despite having had the same total time in the system. I also had an occasion where I left my old multibay set up, too long between cleans, and a corner of one static K1 bay got clogged and went anaerobic. The media in that area went bright white. There may not be evidence from a scientific background Feline, but my situation, whilst anecdotal, convinced me the rapidly darkening K1 holds more bacteria. Looking inside the protected area and to me it looks like "life" as opposed to a build up of dirt. I question why this particular K1 continues to "develop" at a much faster rate than other K1 that is mixed in within the same Nexus. Why would this K1 (initially matured in a static environment) continue to darken whilst the rest of the K1 stays the same? How could this darker K1 become more "dirty" than the K1 right alongside it? And for these reasons, rather than give myself brain ache trying to understand complex stuff, I console myself by believing the darker K1 is holding more bacteria than the lighter K1. Also, it makes me feel better to believe that all my experiments and money spent has enabled me to understand and fix the long standing and very stubborn nitrite problem. I would be devastated it you told me I could have done nothing for the last 7 Months and the problem would have resolved itself! If you look inside a mature piece of k1 with your microscope, they are absolutely teeming with life. ha ha.... No chance I'm going to do that and risk cooking the bacteria I've spent so many Months trying to procure! It was devastating enough discovering I'd dropped a single piece of mature K1 on the floor and it had dried out. Every piece of K1 is like a part of my family, and treated as such for the time being. nah it wont dry out, if you lift them out carefully they remain full of water, infact you need them full of water to be able to see anything. im not sure colour of k1 is a complete indicator of maturity , no doubt its an indicator but not the only factor to consider. You can add new k1 to a filter, after a few weeks treat your pond with p.p and the media will darken up because the p.p stains the k1, and it stains it more if its more mature. Also you can p.p k1 media thats been used before, but maybe it has lay redundant for ages and dried out, or perhaps you've purchased it off some one 2 nd hand, either way its completely dead, but If you p.p it, it goes a lovely brown colour and looks mature, but its not, although I believe it matures much faster, if its once been matured before.